Jamie Smith took six wickets. Peterborough Town paceman Jamie Smith turned in a brilliant spell of bowling to stun Rutland League Division One leaders Uppingham Town yesterday (August 9). He took 6-35 off 12 overs to help send Uppingham packing for 79. Kieron Jones chipped in with 3-5 off 4.1 overs. Uppingham were chasing a victory target of 168 after Town had posted 167-9 off their 45 overs. Opener Chris Milner led the way with 46. 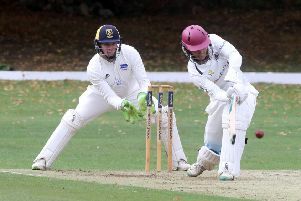 Second-placed Nassington were five-wicket winners at Bourne. Peter Morgan was again in fine form for the Lincolnshire side, making 69, and Sam Evison hit 70 as Bourne were dismissed for 211 in 43.2 overs. Nassington, thanks in the main to an unbeaten 64 from Alex Bandaranaike, reached 215-5 in 35.3 overs. Other valuable contributions came from Conor Craig (41) and Ryan Duffy (47). Wisbech beat Medbourne by 80 runs. They were all out for 302 in 44.4 overs after Josh Bowers had smashed 85 and Tom Meyrick 83. Medbourne’s reply ended at 222 all out. Barnack took the honours in the big derby game against Stamford. Opener Liam Dave was top scorer for Stamford with 57 as they amassed 202-8 and then Barnack got home with seven wickets in hand and four overs to spare. Their main run-getters were Zeeshan Manzoor (49no), Mirza Yasir (59) and Tahseen Ahmed (45).